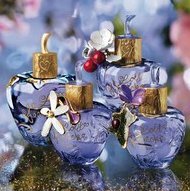 I haven't worn the fragrance in a while, but this set could lure me back. I like the men's LL better than the women's, but these could be interesting, and fun to layer. I WANT!! Any ideas on where to get this yet? I would really like to try this too! And sorry, no idea — I understand it is out in France, but haven't seen it here at all. My husband is flying through Europe on his way home from Iraq at the end of the month…I have him on lookout. I'll keep you posted.